The biotech giant Monsanto just released quarterly earnings statements noting that their profit has fallen by 25 percent compared to the previous year. In the last year alone, the overall value of Monsanto stock has seen a similar downward spiral, falling by nearly 30 percent since the end of Q1 2015. Last quarter, net income was $1.06 billion, or $2.41 per share, compared to $1.42 billion, or $2.92 per share, in the same period a year ago. Total sales for the agricultural behemoth have plummetted by double digits in the last year as well. While Monsanto blames this downward trend on farmers cutting back on spending while being squeezed by plummeting commodity prices, they fail to mention that this trend is only within the biotech realm. As GMO sales decrease, an almost directly proportional increase can be seen in non-GMO and organics. What’s more is the fact that the increase in organic and non-GMO sales owe absolutely nothing to the government. As the FDA greases the skids for their corporate masters, they do nothing but inhibit the growth of companies who ethically compete with them. One example can be seen in initiatives to label GMO. In spite of a massive outpouring of support in favor of labeling GMO products, state and federal government continue to deny it. However, because of consumer demand, companies have taken it upon themselves to begin labeling their own products. Private third-party groups have also risen to the task and have created their own lists of non-GMO foods. As more people become informed about the environmental and health effects of various aspects of the chemical-industrial farming complex, they are spending their money on alternatives. 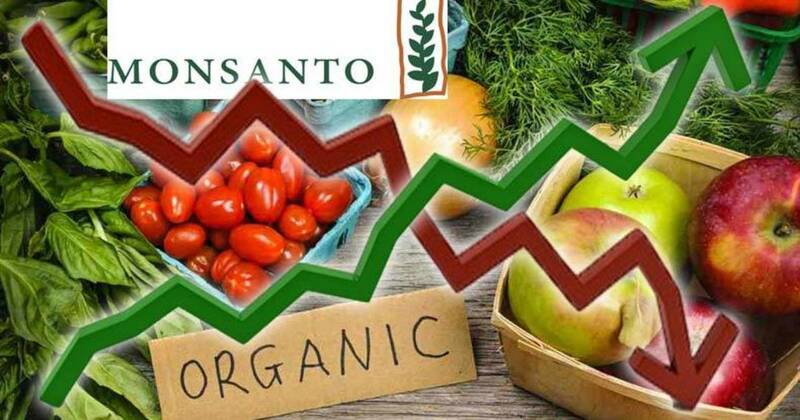 The subsequent increase in demand for organic and non-GMO has driven down costs thereby increasing availability. Less than a decade ago, the only place to find organics was at specialty stores. However, organics now even have a presence at convenience stores. It cannot be emphasized enough, that this massive shift in the food paradigm is due to consumer demand, i.e., voting with your dollars — not government intervention. Sadly and expectedly, the federal government is little more than a revolving door for industry insiders who use their elected and unelected authority to grant themselves special privileges to weed out their competition. This year, for the first time, the FDA has been forced to begin testing certain food products for the presence of glyphosate, the active ingredient in Monsanto’s Round-Up. This move by the FDA was not based on the interest of the public, but only because private companies had been exposing dangerous levels of this herbicide in everything from baby formula to beer. The FDA’s failure to test for glyphosate was among the things the agency was criticized for in a 2014 audit by the Government Accountability Office (GAO). While stopping short of demanding that the FDA conduct glyphosate testing, the GAO said the agency should, at the very least, publicly disclose that it does not do so. While it once may have seemed that Monsanto was this cancer spreading across the globe in their attempt to control the world’s food supply, this image seems far less likely now as more consumers wake up to the dangers of funding such unsustainable practices. However, although the organic industry is still growing at double-digit rates approaching $37 billion annually, we cannot let down our guard. Rest assured that the biotech insiders within the marble halls of D.C. are pining away at this very moment thinking of ways to eliminate their sustainable adversaries using government legislation.